The year is well underway now and kitchen trends are in full force. 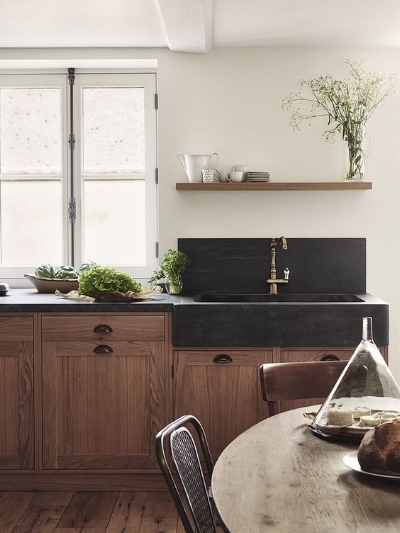 I love looking at the new trends for the kitchen since it’s my favorite space to design, but I also like to absorb them and see if I really think they are a trend that’s realistic, functional and worth the investment. So here’s my rundown of my favorite and not so favorite kitchen trends of 2018. 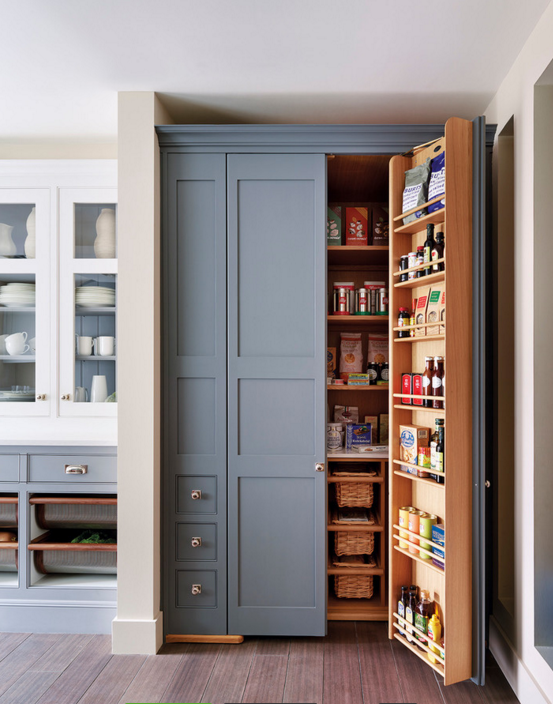 I love this fresh take on a pantry. These floor to ceiling cabinets are packed with storage and I like that they balance out the height and size of refrigerators. They are a great alternative or in addition to walk-in pantries. You have all your essentials right a short step away. I’ve found these are a great solution in remodels where you remove the small pantry or move the kitchen to a new space. White kitchens have been all the rage for years and it’s a classic look that will never go away. 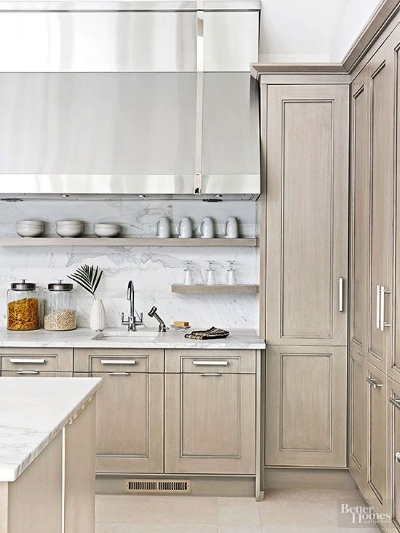 But lately, we’ve been trending back towards wood cabinetry. Don’t think dark oak cabinets. Think more light natural wood. I love the unfinished, natural look of the wood graining. One client at a time, I’m convincing them that drawers really are better than doors. You can fit so much in deep, wide drawers. 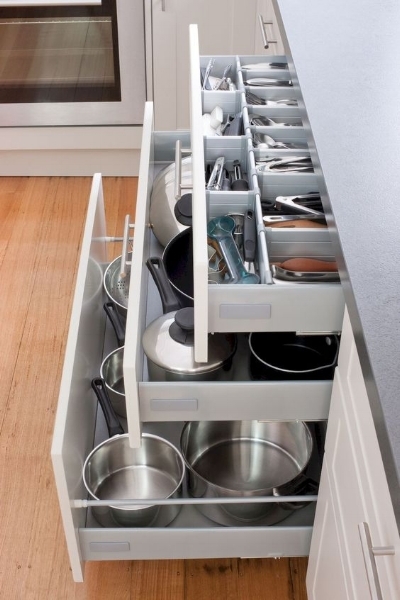 There’s less stacking and digging with drawers. 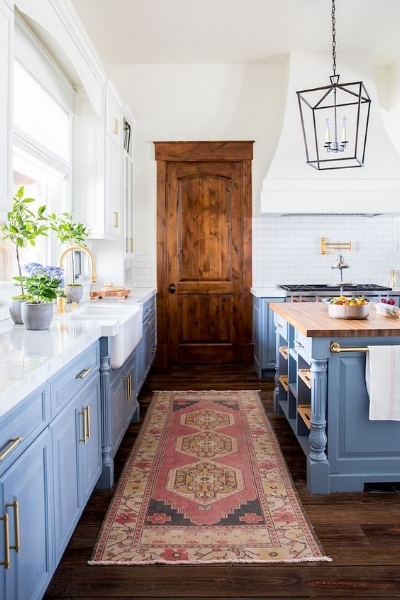 I love the look of vintage rugs and it’s a great and inexpensive way to temporarily add color to your kitchen. I’m a sucker for butcher block, so I love the idea of having it built into my island. Beautiful, statement piece that’s functional. It’s crazy the number of new “smart” gadgets that come out each year for the kitchen. Some of them seem fancy and over the top, but there are a lot that just makes life easier. For example, motion sensored faucets, Amazon dash buttons and smart light switches/bulbs. 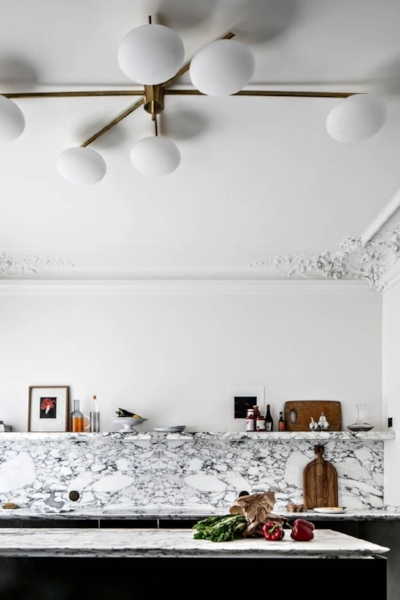 You’ve got to have the right kitchen for a statement hood, so I’m totally onboard with this disappearing vent hood trend. Sometimes the hood seems out of place or like it’s stealing the spotlight. With a disappearing hood, you get a clean, seamless look. I just can’t do it. Maybe I’ll come around to this look, but it’s just too much for me. A couple pros: its custom and it unique. Ok, I love this look. I think it’s beautiful. It’s just not practical. 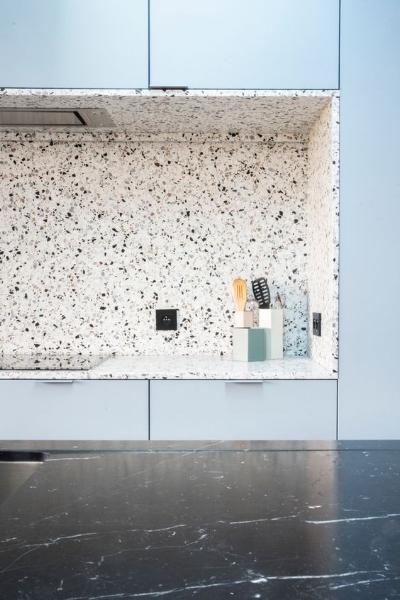 You are limited to the materials you can choose (marble would be so expensive) and the wear and tear on the material may not stand up well to the constant water and soap. I’m still on the fence about whether I like this. It just doesn’t seem practical unless you have a huge kitchen or pantry to make up for all the lost storage. In my kitchen, it would just get messy with piles of stuff up on it. I do love the clean look of the flat face fronts, but I don’t foresee this look lasting very long because it has such a modern look to it. Colored appliances are so fun, but one of the last things in your kitchen you want to go out of style is your appliances because that’s an expensive change. If you want colored appliances, pick a color in your color palette (my 5 steps for a color palette), plan to stay in the house for a long time and make sure you have a good warranty (colored appliances can be pricey). All I think of when I hear square tiles is that light pink 1970’s bathroom tile and public restrooms. Square tiles seems so commercial to me unless they are laid in a unique pattern. So unless it's laid in a running bond pattern (tiles offset by half the width of the tile below), I don't know that I'll ever get on board with this trend. 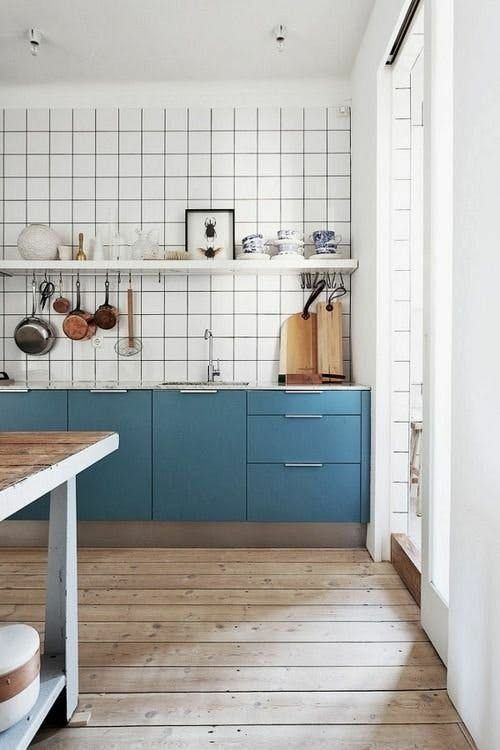 There are so many more trends for kitchens this year. What are your favorites? You agree or disagree with me or have others that you like?